Emerald Ash Borer | John B Ward Co.
Canopy Death and Sprouting from EAB Infestation and close up of Woodpecker Damage on Emerald Ash Borer Infested Ash Tree in Michigan. Emerald Ash Borer (EAB) is a wood-boring insect native to Asia that was first discovered in Pennsylvania in 2007. It was found in Bucks County in 2012 and has been creeping steadily toward our area. We believe that EAB is probably on the Main Line, but has not yet been officially confirmed. If you have ash trees that you want to save, it is important to have them treated this spring. 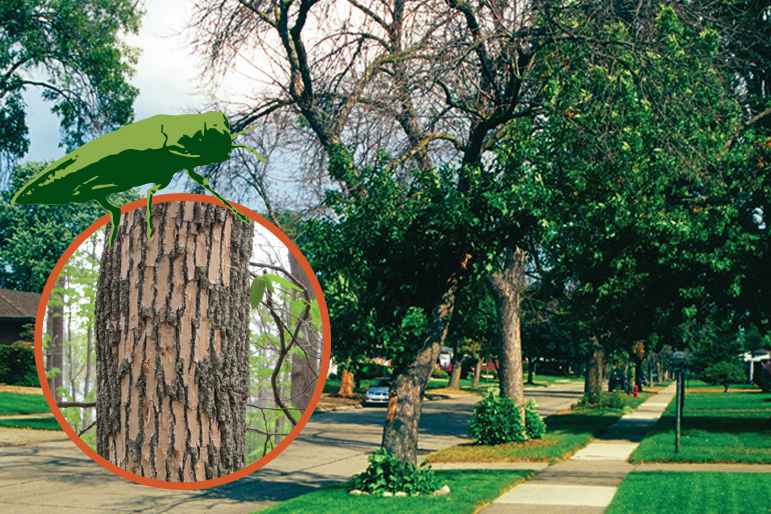 When EAB sweeps through an area, it typically goes unnoticed for several years; then a population explosion occurs and every unprotected tree in the area quickly gets overwhelmed by the pest. This is what happened in the Midwest, and it could happen here. We believe that this will be the last spring when we have a chance to stay ahead of EAB. So if you want to protect your ash trees, or if you are unsure if you have any ash trees, please call our office to make an appointment with an arborist. Time is running out.